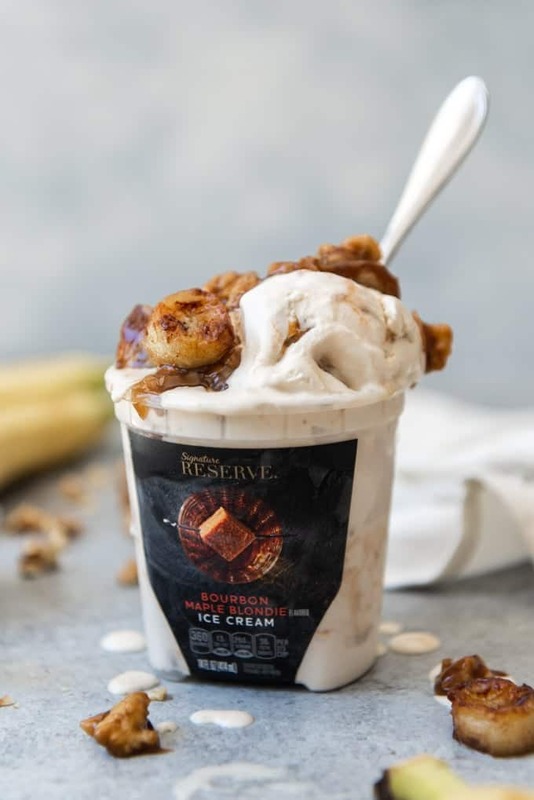 Simple Pan Fried Butterscotch Bananas & Walnuts make an excellent ice cream topping for out of this world ice cream sundaes, especially when paired with an amazing flavor like the new Signature Reserve™ Bourbon Maple Blondie ice cream! There is something so incredibly wonderful about an ice cream sundae. 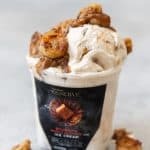 I mean, ice cream is already wonderful all on its own, but when you turn it into a sundae, it really elevates the dessert and makes it something truly special and indulgent. 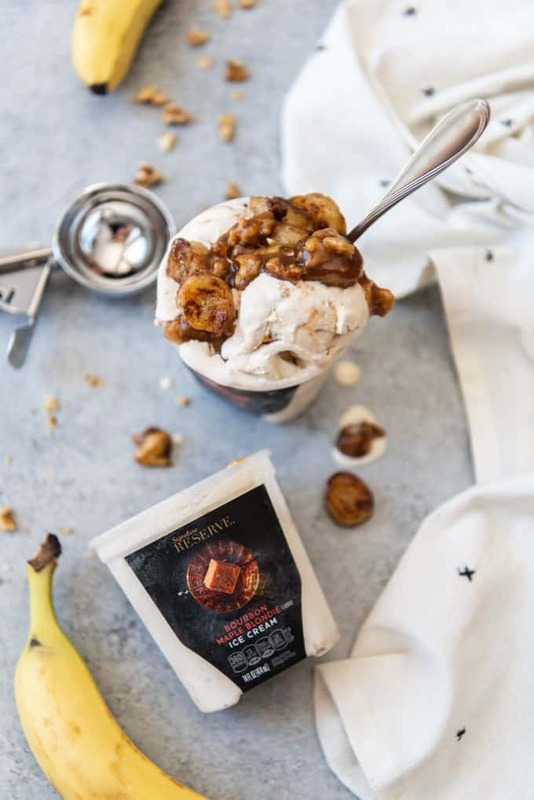 And while chocolate syrup may always be the most popular ice cream topping ever, I think that these pan fried butterscotch bananas & walnuts in a quick and easy homemade butterscotch sauce is a contender. 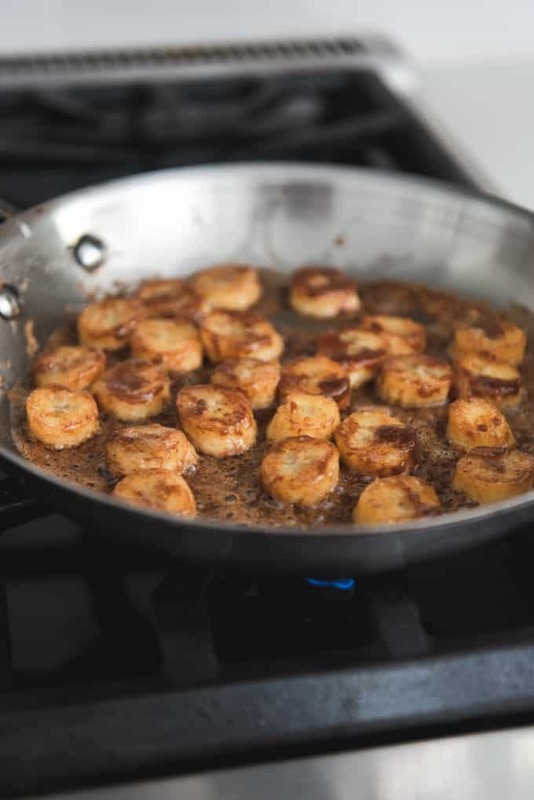 It only takes about 5 minutes to make homemade butterscotch sauce, and another five to fry up these caramelized bananas. And why not serve these sundaes straight out of the container for a fun, quirky presentation? 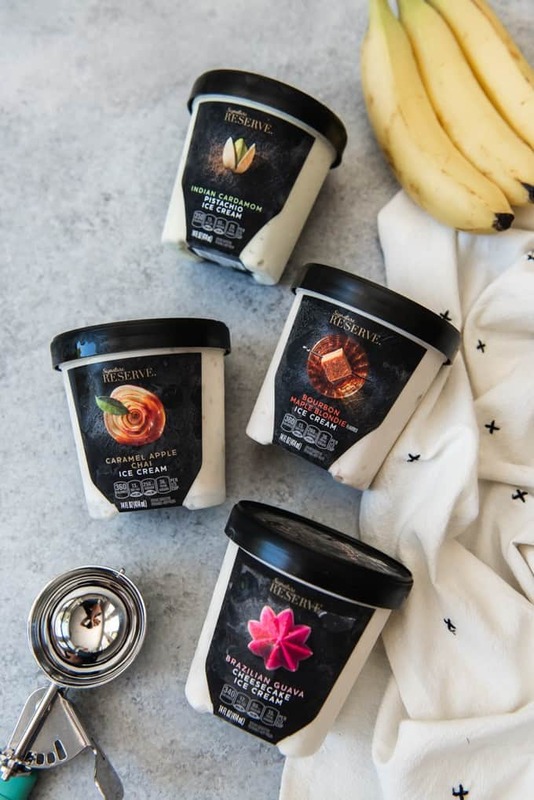 Especially when the containers are pretty, like these NEW Signature Reserve™ Super Premium Ice Creams that are available in the San Francisco Bay Area exclusively at Safeway stores. All of the Signature Reserve™ Super Premium Ice Creams are perfectly balanced with flavors from around the world. They aren’t just your basic, everyday flavors either. Each Signature Reserve™ Super Premium Ice Cream is a unique flavor with globally-sourced ingredients. 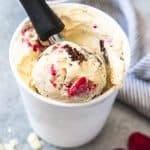 I’m particularly obsessed with the Indian Cardamom Pistachio, Brazilian Guava Cheesecake, and the Bourbon Maple Blondie Ice Cream that inspired today’s post. To make pan fried bananas, start by slicing two perfectly ripened bananas about 1/2″ thick. This is not the time to use overripe bananas that have been sitting on the counter too long. Since the bananas will soften in the pan as they cook, overripe bananas can turn to mush if you try to fry them. 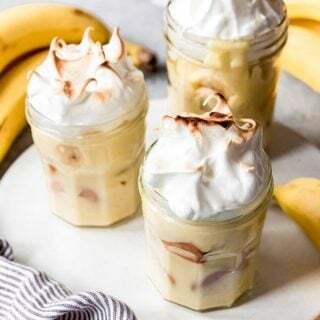 I would even go with slightly underripe bananas for this recipe. 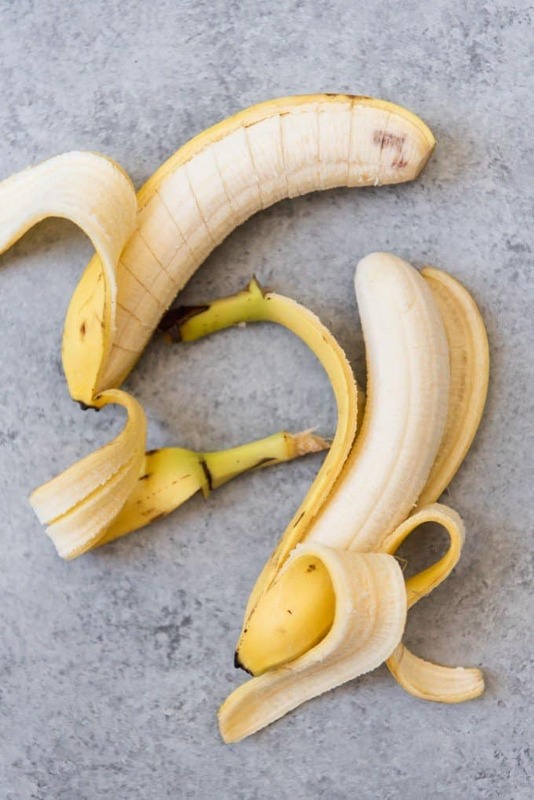 I know that people have strong feelings about what constitutes a perfectly ripe banana, but for purposes of this post, lets just say that it will be yellow, not green, and have no black spots on the peel. We’re still friends, right? Then add some butterscotch sauce to a frying pan or skillet, along with a little bit of cinnamon. 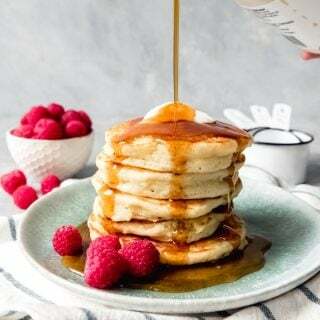 If you happen to already have butterscotch sauce in the fridge, you can totally use that, or make it from scratch using the recipe below, which is super quick and easy (and worth making double of so you have some butterscotch on hand for dessert emergencies!). 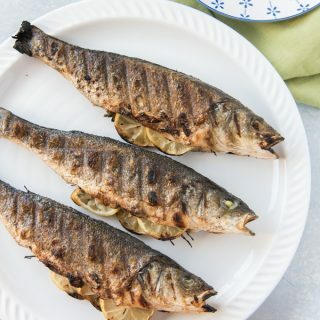 Once the sauce is hot, add the sliced bananas and cook for a few minutes on each side until they are caramelized, browned and sticky. 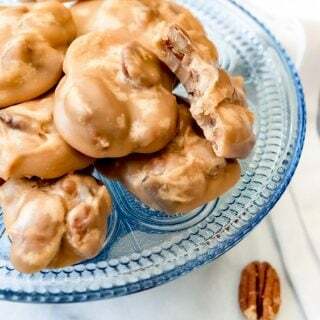 You could eat them just like this for a delicious snack, but try to hold off for a hot minute while you heat up the rest of the butterscotch sauce with the chopped walnuts! What is the difference between butterscotch and caramel sauce? First, both butterscotch and caramel are light brown, sweet sauces that are made with sugar, butter, and typically cream. But little tweaks make them unique. The biggest difference is the type of sugar used. Caramel is typically made with white granulated sugar, butter, and cream. Butterscotch, on the other hand, is made with brown sugar. And there really is a flavor distinction because of the sugar choice! 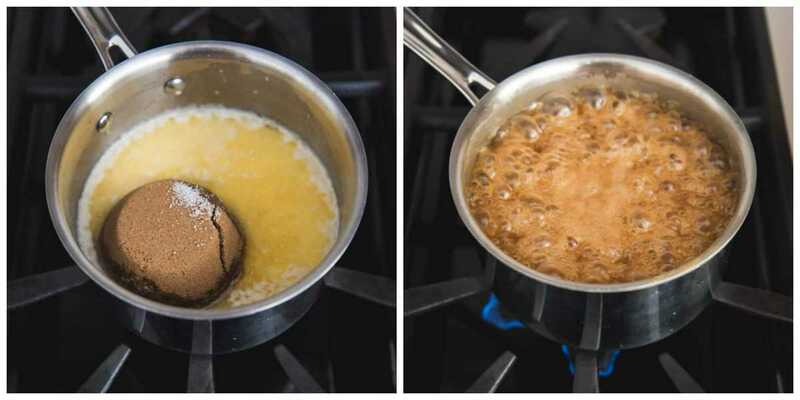 Another distinction is that while both sauces are usually made with cream, that flavor isn’t as notable in butterscotch as it is in a caramel sauce. And if you don’t have cream on hand, evaporated milk would work as well. Making homemade butterscotch sauce is quick and easy, with no thermometer required. 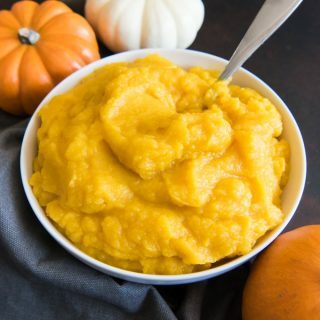 Just melt the butter in a medium saucepan, then add the brown sugar, cream, and salt and bring to a boil for five minutes, stirring frequently. That’s it! 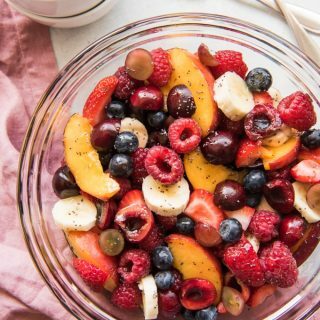 It’s super delicious just like this, but even more amazing when added to bananas & walnuts for ice cream sundaes. There is something slightly naughty about eating ice cream straight out of the container, isn’t there? But we’ve all done it and there’s no shame in that game! 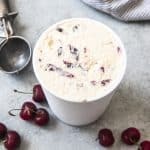 Which is why I think serving this rich, indulgent Bourbon Maple Blondie ice cream as an ice cream sundae using the container it came in is a great idea. To make space for the butterscotch bananas & walnuts, first scoop out a good-sized scoop from the top, spooning in some still slightly warm bananas, walnuts, and butterscotch, then replacing the scoop and topping with a few more strategically placed caramelized bananas and drizzling with the walnuts and butterscotch sauce. This recipe is enough to make two, easily shareable ice cream sundaes. 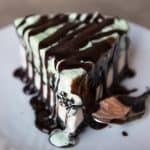 It’s super decadent and really fun. 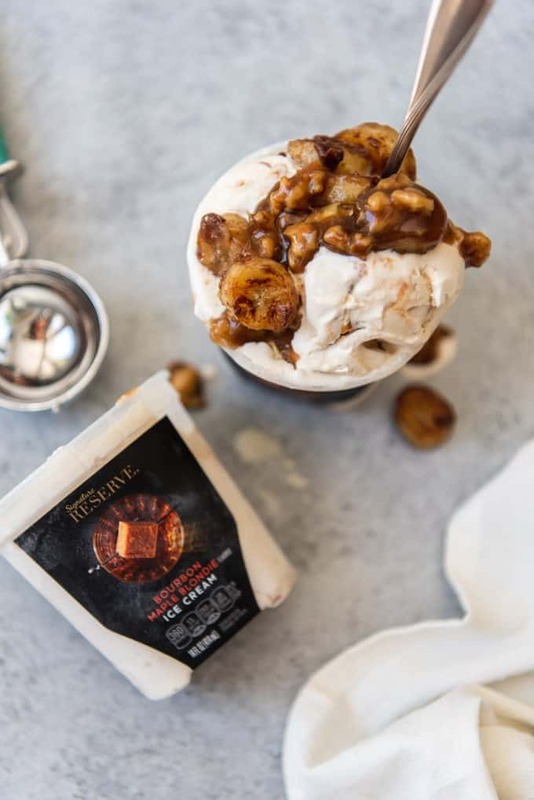 The flavors of banana, bourbon and maple are amazing together, and the texture of the creamy, indulgent ice cream with blondie crumbles and crunchy walnuts is absolutely divine. I buy my Signature Reserve products at my local Safeway, and you can also find them exclusively at all of the Albertsons Companies family of stores, including Albertsons, ACME Markets, Jewel-Osco, Vons, Pavilions, Randalls, Tom Thumb, Shaw’s, Star Market, and Carrs/Safeway. 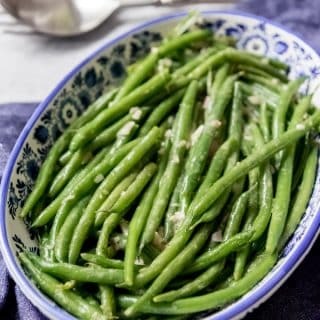 Visit safeway.com to find a store near you and discover more recipe ideas. In a large pan, add 1/3 cup of butterscotch sauce and the cinnamon, stirring to combine over medium-high heat. When the sauce starts to bubble, add the sliced bananas and fry for 2-3 minutes on one side, just until caramelized and lightly browned. You might need to adjust the heat down to medium if the bananas are cooking too quickly so they don't burn. 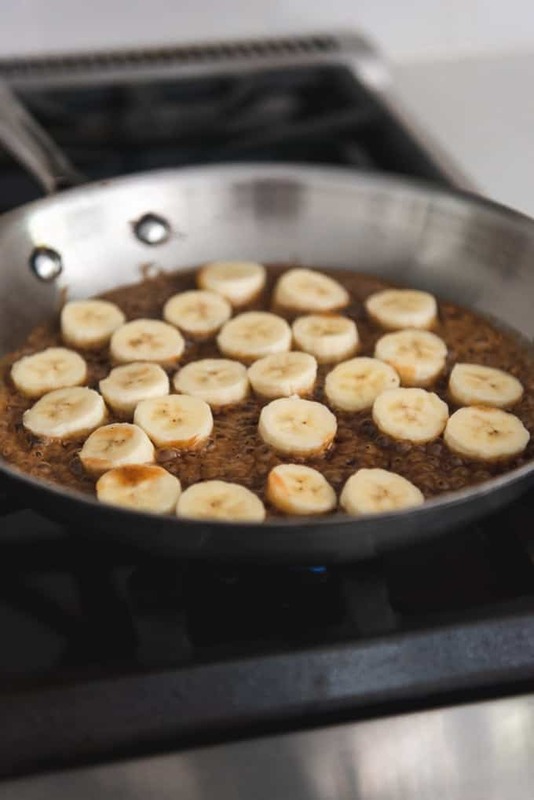 Flip the banana slices over using a spatula and move them around in the pan to soak up the butterscotch sauce. Cook for another 2-3 minutes until the bananas are slightly softened and caramelized on both sides. Remove from the pan and set aside. Scrape out any caramelized sauce in the bottom of the pan, then add the remaining 2/3 cup of butterscotch sauce and the coarsely chopped walnuts to the same pan. Stir to combine and heat just until the sauce starts to bubble, then remove from the heat and allow to cool slightly until just warm. Open the containers of Signature Reserve Bourbon Maple Blondie ice cream and use an ice cream scoop to scoop out a couple of scoops on top so it slightly mounds on itself and gives you space to add some of the butterscotch bananas, then spoon some of the walnuts and butterscotch sauce over the top and enjoy straight out of the carton! To make the butterscotch sauce, melt the butter in a medium saucepan. Stir in the brown sugar, cream and salt, then bring to a boil over medium heat. Cook and stir for 5 minutes until slightly thickened, then remove from the heat and stir in the vanilla. Makes about 1 cup of butterscotch. This is a sponsored conversation written by me on behalf of Safeway . The opinions and text are all mine.